The autumn semester 2014 started on Monday, 18 August, for us at the School of Computer Science at Reykjavik University (SCS). As usual at this time of the year, teaching-related matters took centre stage and occupied most faculty members, especially since we had just welcomed our third intake of well over 300 new computer science students. However, many of us at the Icelandic Centre of Excellence in Theoretical Computer Science (ICE-TCS) will remember the first week of the new academic year for two events showcasing the artistic and scientific work of Erik Demaine, who visited ICE-TCS and the School of Computer Science at Reykjavik University in the period 20-27 August. 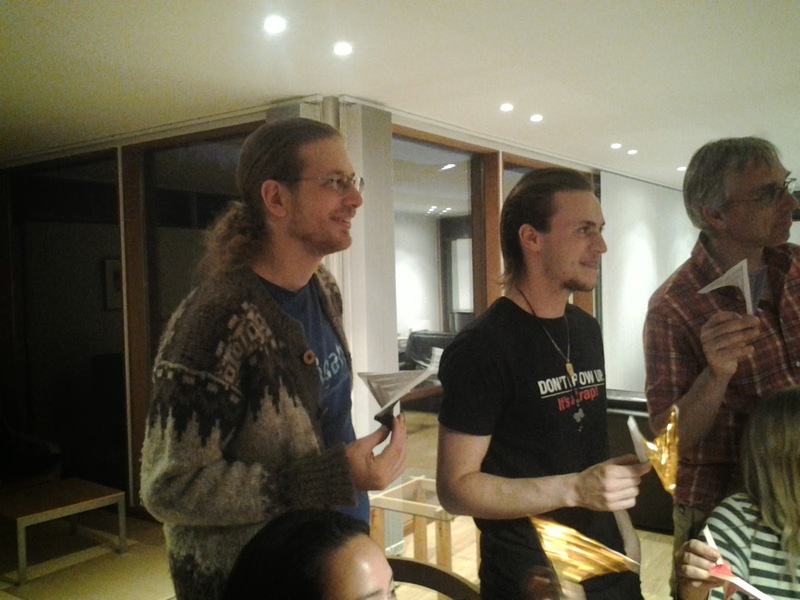 The first event, Crossroads of Art and Science, took place on Thursday, 21 August 2014, from 5pm till 7pm GMT, and was organized by ICE-TCS, SCS and Vísindafélag Íslendinga (the Icelandic Academy of Sciences). 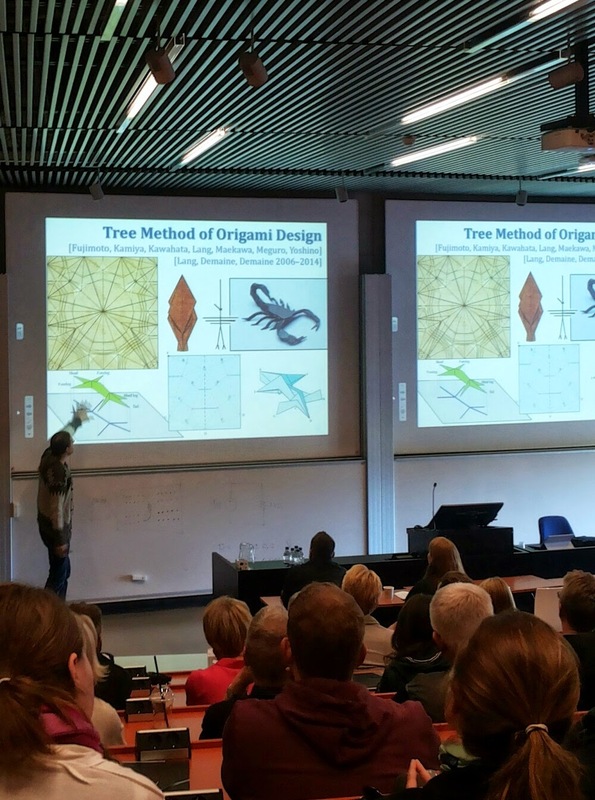 It was attended by about 220 people, including a good number of our undergraduate students, and featured a keynote address by Erik entitled Folding Paper: Visual Art Meets Mathematics. Art and science are often viewed as very different, and somewhat antithetic, human endeavours, so much so that some artists happily profess ignorance of the basic methods and results of science and some scientists sneer at art. In 1959, this prompted British scientist and novelist C. P. Snow to express his view that "the intellectual life of the whole of western society" was split into two separate cultures---namely the sciences and the humanities---and that this was a major hindrance to solving the world's problems. However, we can all mention key figures from the Renaissance and earlier times who were both artists and scientists. Is the breed of the Renaissance man a thing from a long gone past? The aim of Crossroads of Art and Science was to provide resounding evidence that the distinction between art and science in modern society is fictitious. We did so by showcasing three figures of polymaths whose work, be it artistic or scientific, benefits from the interplay of art and science. In case you have not done so already, do look at the inspirational video Erik produced when he received the Presburger Award 2013. Crossroads of Art and Science also featured two Icelandic speakers. Anna Hrund Másdóttir is an artist and a mathematics teacher who teaches mathematics to support her art practice and whose teaching benefits from her artistic work. Kjartan Emilsson, a mathematical physicist by training, uses artistic methods of working and thinking in his work as Principal Game Designer and Studio Managing Director at CCP in Shanghai, where he directs the innovation and implementation of core virtual world game designs for CCP Games. The thesis underlying Crossroads of Art and Science was that art and science are not antithetic, and that their cooperation can lead to powerful ways for solving scientific problems and to creating new art forms. As Nicholasof Cusa put it in his philosophy, and as Anna Hrund wrote in the title of her presentation, we are in the presence of a "coincidence of opposites". We like to think that the people attending the event went home agreeing with that message. How can we build reconfigurable robots like Transformers or Terminator 2? How can we orchestrate the motion of a large swarm of robots? How can we build Star Trek-style replicators that duplicate or mass-produce a given shape at the nano scale? While addressing the first question, Erik gave us a whirlwind tour of his work on the equivalence of models for modular robots, hinged dissections (see this Wikipedia page for a brief introduction) and robotic paper. He also mentioned some of the work done in the context of the Millibiology project at MIT. Of course, the recently unveiled origami robot featured in this part of Erik's presentation, as well as some of its early incarnations. In his discussion of problems related to robot swarms, Erik mentioned the distributed boundary detection algorithm he developed with James McLurkin, which is suitable for use on multi-robot systems with dynamic network topologies. The game of Tilt also featured in this part of Erik's talk, together with a sketch of the proof of its NP-hardness. Finally, we were given a glimpse of some of Erik's fascinating work related to replicators. Two highlights were staged self-assembly of Wang tiles and shape replication in the Wang tile self-assembly model. Amongst other things, Erik showed the audience how to make infinitely many copies of any shape without holes in a single stage! Last, but by no means least, the Theory Day 2014 included two presentations by members of ICE-TCS. Marjan Sirjani discussed some work done by her research group in Reykjavik and Tehran on analysis of network-on-chips using probabilistic timed actors. This work uses the language Rebeca and its tool set. Christian Konrad closed the programme by presenting work on Robust Set Reconciliation, which was selected for presentation at SIGMOD 2014. At the end of the scientific programme, the attendees mingled while being treated to chocolate and sparkling wine. 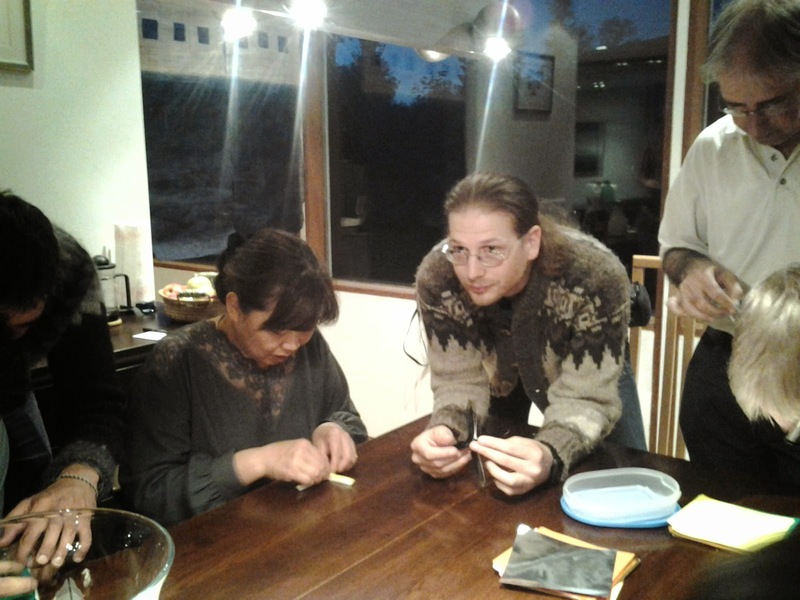 As you can see, the fun continued after dinner with an impromptu origami masterclass where people attempted to fold a hyperbolic paraboloid (Albers 1927). The instructions are here. 2008: None, but we had all the ICALP invited speakers in July. 2010: David de Frutos Escrig and Carlos Gregorio-Rodriguez (both at the Universidad Complutense de Madrid). We will see what the future will bring and look forward to celebrating the tenth birthday of ICE-TCS next year. Whatever we do, it will be hard to top the impact and national visibility of last week's events.